be sure to stop by here…for tea and a giveaway! We had rainy days off and on all week so I got caught up on ornament making for the year. 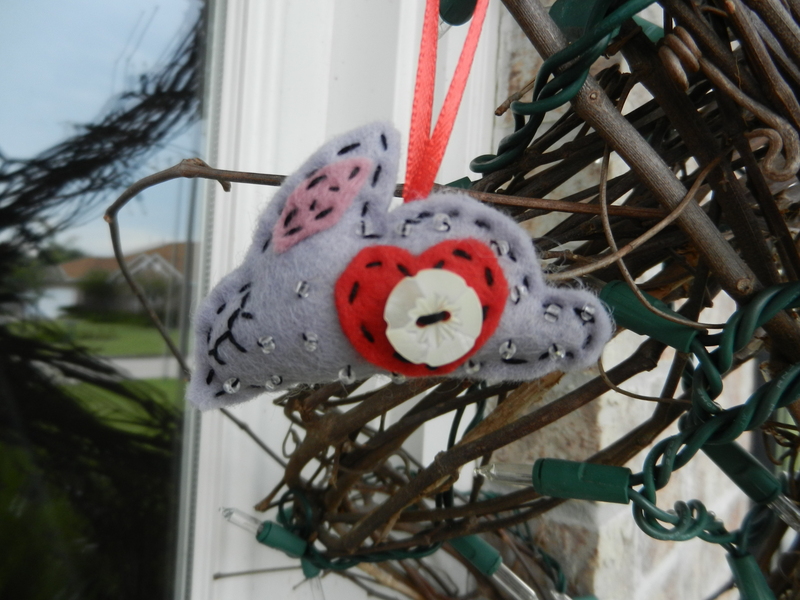 My goal is to make 1 ornament a month so my YOE tree will have some cute new ornaments. Here is a birdie I made using attic24’s tutorial. 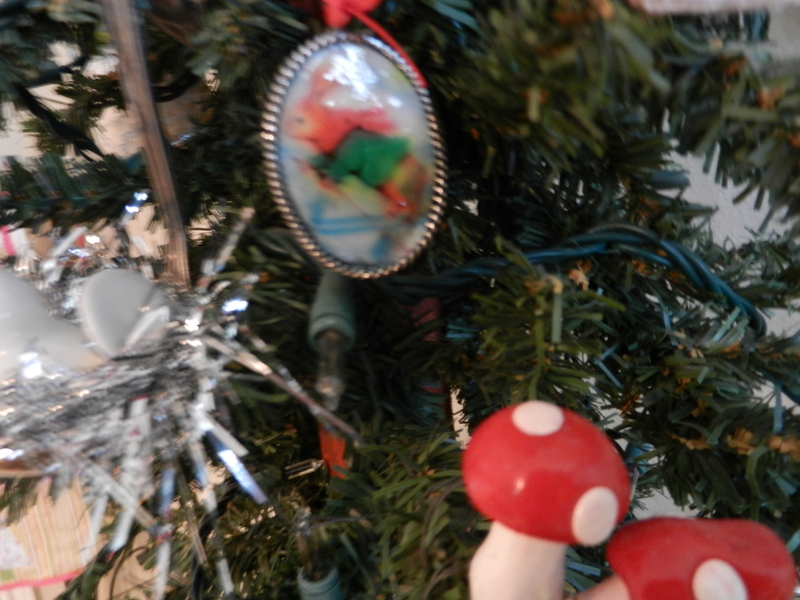 In my opinion, you can never have too many birdies on your tree. 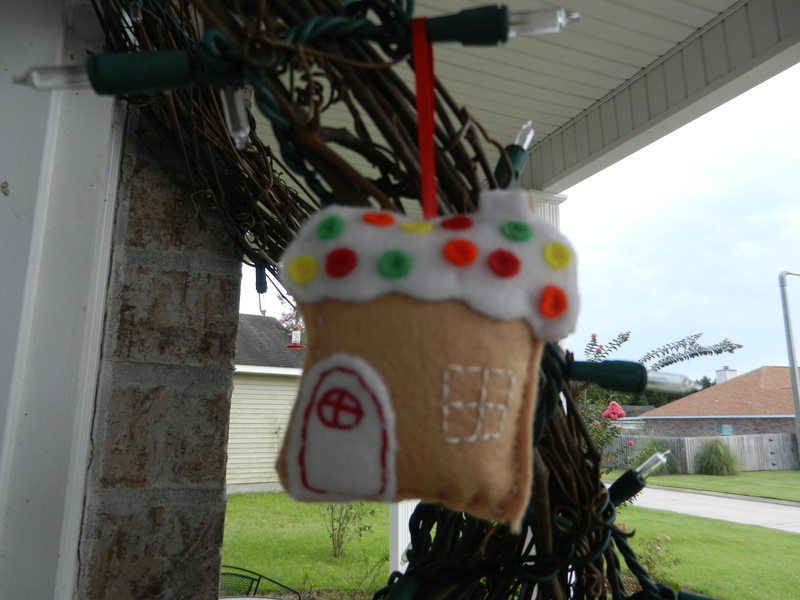 And this little house was made using a pattern from Fa La La La Felt. I pretty much did everything wrong…wrong tan color, wonky window, too few scallops…but that doesn’t bother me. I’ve learned to not let imperfections bug me! this is a little rabbit inspired by Bijou’s Whimsy. Her work is amazing. To see other ornaments I’ve made this year, click here. 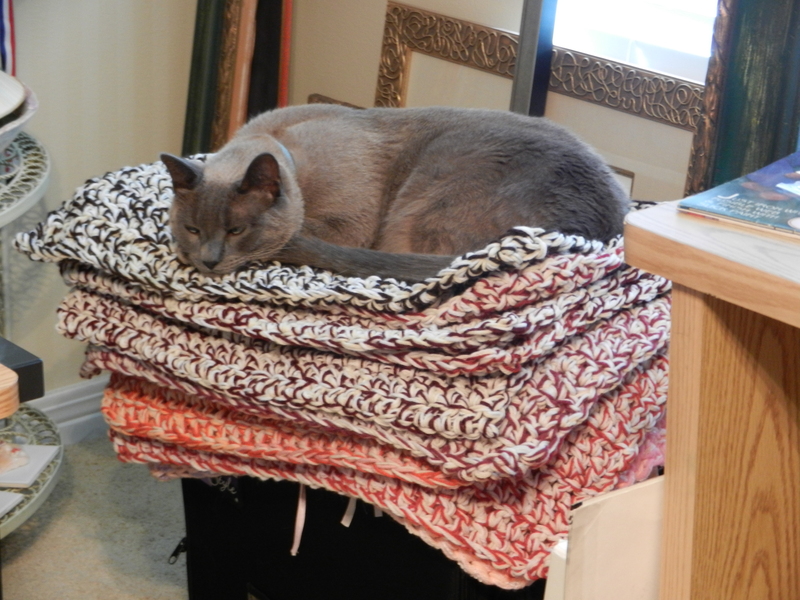 When I carted all my supplies back into the sewing room, I saw Leo and immediately thought of the storybook ” Princess and the Pea.” He looks so cozy on his little tower of kitty beds! Earlier in the month,I made an eel to drop in Florida (link). I didn’t get to drop it though, there was too much going on. Instead, I found a new medical clinic here and decided to drop it there but each time I would pass the place, there were too many people around. Half the fun of making these toys, is dropping them while no one is looking. This morning, I took Mojo to be groomed and noticed they had a planter out front so I dropped Mr. Eel there. Here he is waiting to be taken home. I hope he is gone when I go pick Mojo up! 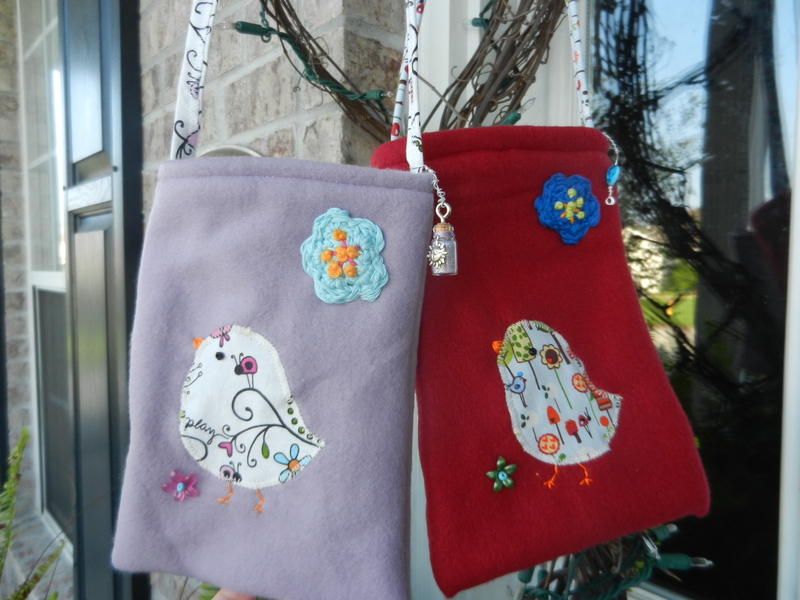 Then, deciding I needed to get down to Christmas crafting, I made 2 little purses with appliquéd birdies. 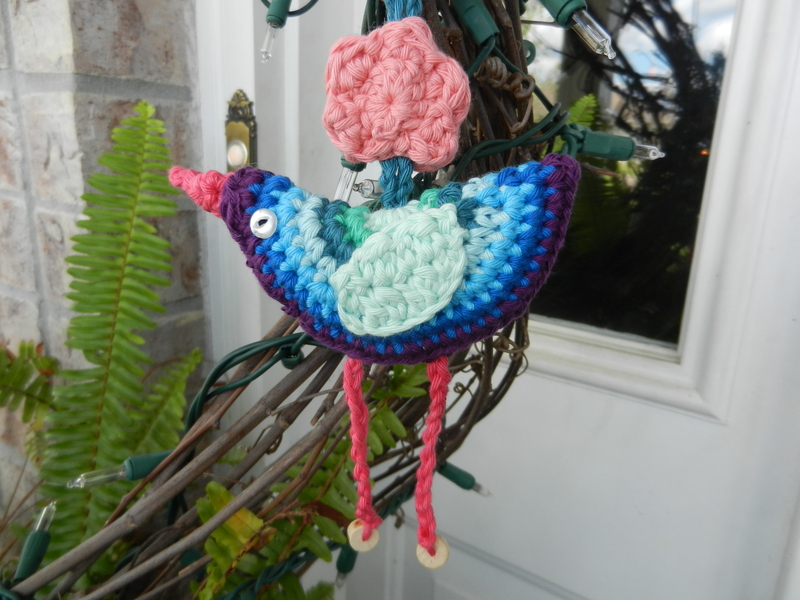 I added a crocheted flower and charm for fun. July’s MIM gift (link) is done! 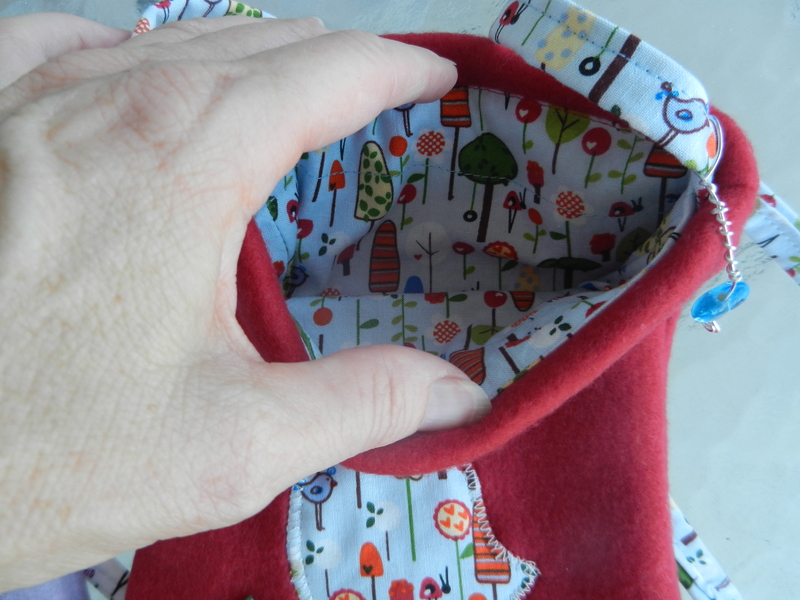 I’m going to put a few goodies inside each purse before wrapping them up for Christmas. Maybe a toy and one of those plastic coin holders that will open when you squeeze it. My mom always said you have to put a penny inside a purse for good luck when you give it as a gift. I continue to crochet cat beds for the local animal shelter. I’m up to 10 now and hope to do several more by fall. It is just a simple mat but my cats love them and will use them until delivery day. If you want to see them or get the how to, click here. 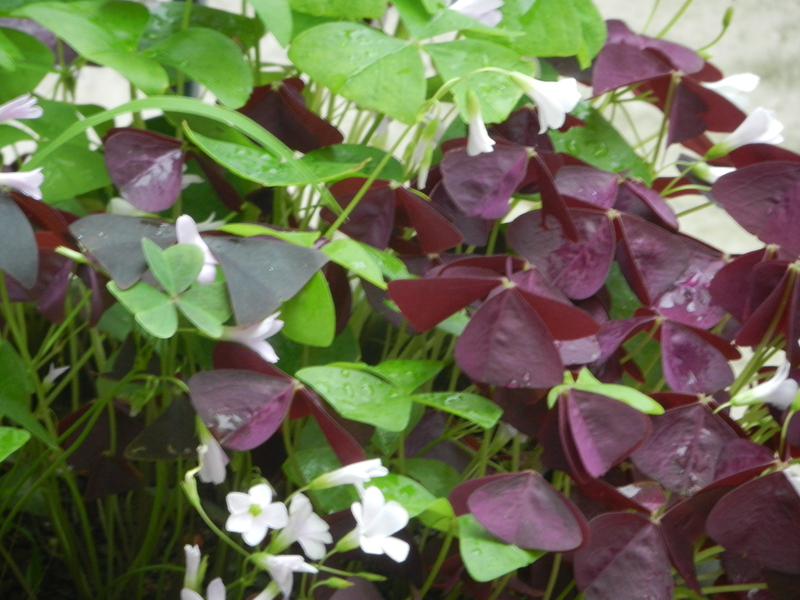 I love oxalis. My dad introduced me to this hardy little plant when I was a kid and I’ve been in love with it ever since. It is also known as wood sorrel or shamrock. I have it in my yard and in pots on our patio. 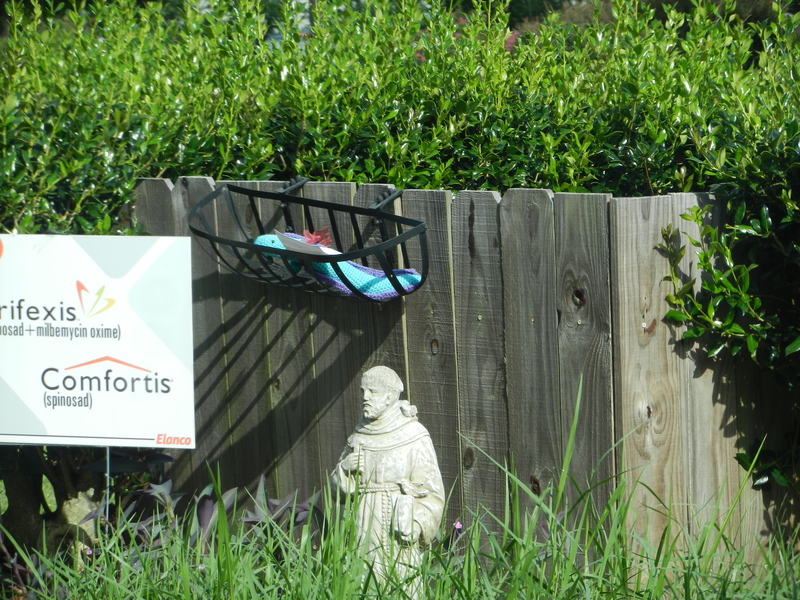 It is a nice addition to plantings and comes back year after year. This particular pot came about when Dean was enlarging one of our landscaped beds in June. We were removing some of the oxalis and he had dug them up and set them on the ground. We simply forgot about them and when I found them several days later, all the plants had fallen off and been turned under. I didn’t know I had a mixed pile of legumes and just planted them. Imagine my surprise when they all popped up like this. What a pretty accident! Some blooms are pink, some are white…but all are lovely. While the rest of the US is in drought, we have rain to spare. This week has been full of thunderstorms and more rain than we need. 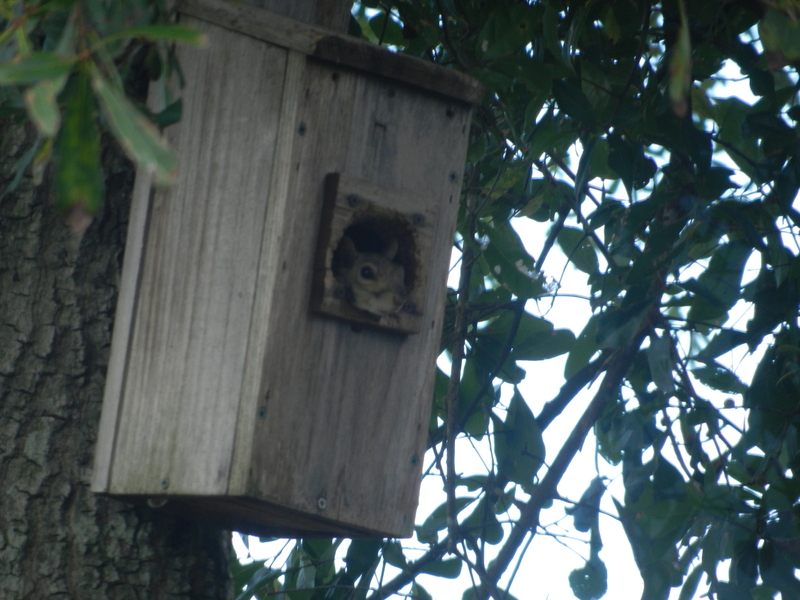 The good news is that with all the rain, momma squirrel moved into an old birdhouse. She chewed the hole bigger during a rainstorm last week and she and her mate took turns checking it out. With the onset of the really heavy storms this week, she has remained inside. She is very large now and I’m sure she will give birth soon. I’m happy I could get a decent photo of her, she moves so quickly that she is usually just a blur. I posted about my lovely angel a few weeks ago on my original blog. 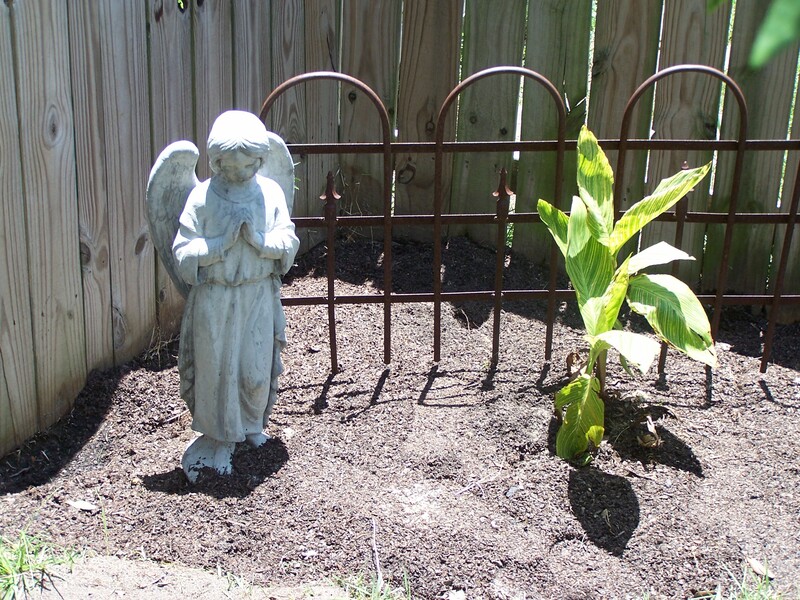 The area we placed her in was devoid of plants and she looked a bit lonely…but it was by design. I had saved 2 large envelopes of wildflower seeds that needed a home and knew they would be perfect in this triangular bed. 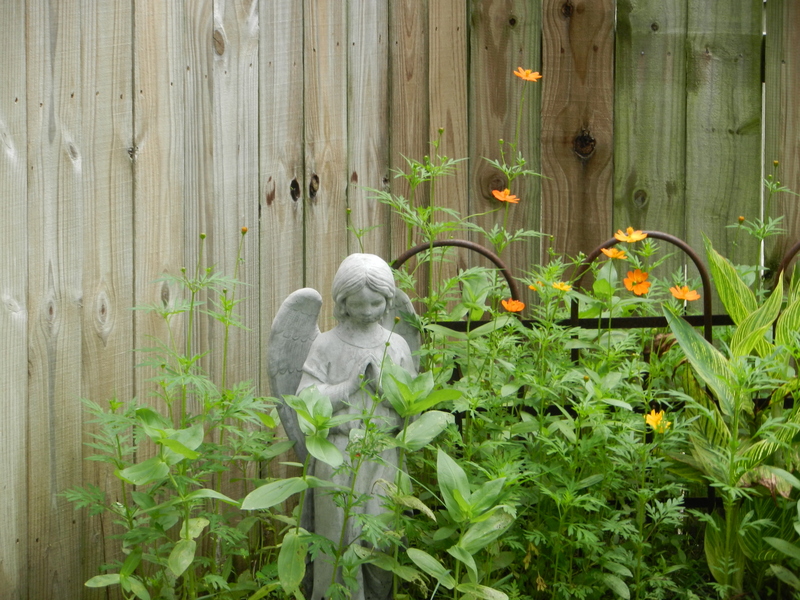 I adore wildflowers and when we redid our yard, I had forgotten to save them a location. This spot tends to stay dry, which is perfect for the ones I grow. Today is my birthday and in honor of my still breathing, I’d like to reflect a bit. In order to do so, I have show and tell to help me along. 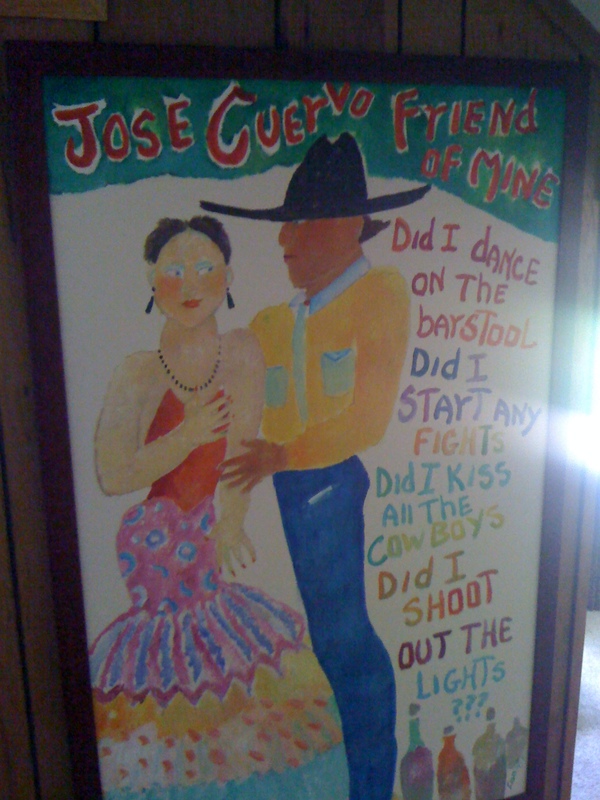 This picture by Ann Frantic is hung in my parent’s home. I fell in love with Ann’s work when my sister started selling her art years ago. If I could, I’d do an entire house around her work…it is amazing. But I digress. Now that I’m older and all grown up and mature (and stuff), I don’t …but I ain’t dead yet so I still like to have a good time. I just happen to take my tequila in the form of frozen margaritas now!